HONOLULU MEDICAL GROUP. 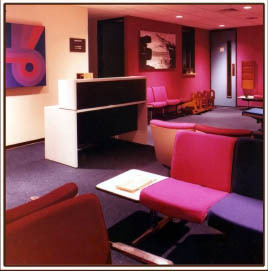 The scheme of this medical groups public areas was to be cheery and uplifting as well as graphically easy to find your way around. To accomplish these ends, a decorative palette of analogous colors was derived to make each floor unique in appearance and psychologically positive. This positive and uplifting use of the psychology of vibrant color was possible because only five steps of color (analogous) were used per floor  in upholstery, wall covering, carpet, and even in graphic art. This created an ambiance that was, at the same time, energizing and calming. The artwork also utilized a counter point of black and white photography by one of Hawaiis premiere photographers of "escapist" subjects of people at play in places familiar to those who will be sitting in the waiting areas. The strong color harmony also makes it easy to remember your floor for subsequent visits. INTERISLAND CORPORATE. 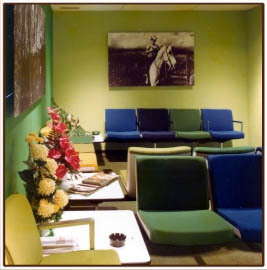 The corporate office of Interisland Resorts was designed to reflect the local heritage of the company and its founders. The only locally owned hotel chain in Hawaii, Interisland had a proud history of growth in the islands with the Kona Surf, Kauai Surf, and Maui Surf properties. 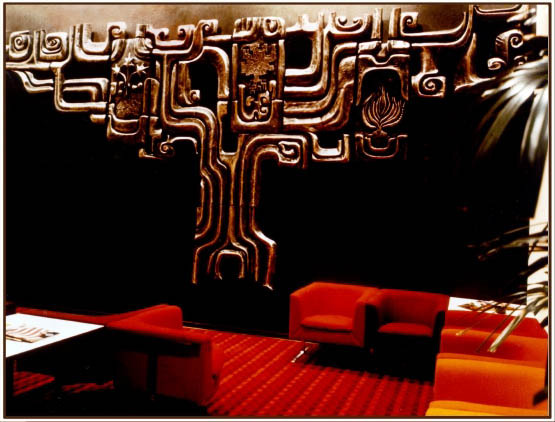 The corporate offices were detailed in koa and native textures. The collection of Hawaiian art and artifacts displayed in the corridors was of museum quality. 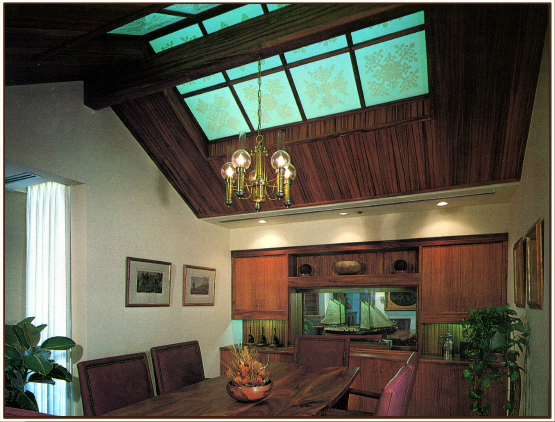 The sky lights were etched with Hawaiian quilt patterns. The custom made furniture reflected the Boston missionary influence of the mid-nineteenth century. Such furniture was in evidence in the office of the original merchant families that started the Hawaiian commerce of trade and tourism.